The area around the bay of Naples (It: Napoli) is famous for its beautiful landscape and because of the Vesuvius, Capri, Ischia and the ruins of Pompeii and Herculaneum. A less known aspect is that it also includes one of the larger aqueduct systems in the Roman world, the Aqua Augusta. This system of aqueducts was built in the time of Augustus, probably between 30 and 20 BCE when Marcus Vipsanius Agrippa was curator aquarum in Rome. The peninsula west of Naples, on the northern side of the bay, is unusual because it consists of a large number of overlapping craters of very young and partly still active volcanoes. This gives rise to very fertile soil and the presence of a large number of hot springs, which, together with the great natural beauty of the area made it attractive for settling. Not only old Greek towns such as Cumae and Neapolis are situated here but also Puteoli (present Pozzuoli), in Augustus time the most important commercial harbour for Rome. 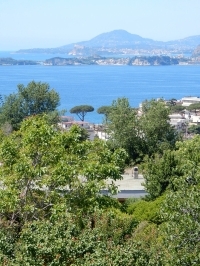 The area was also very popular with the rich and numerous villas crowding the hills, especially west of Puteoli and at Baiae. Now, this is a rather low-profile suburban area, but in the time of Augustus the most expensive pieces of real estate in the roman world could here been found, an area of leisure where the rich tried to outdo each other in the luxury of their sumptuous villas. The area was also of military importance because of its excellent natural harbours. During the war with Pompeius, Augustus ordered the construction of a harbour complex just west of Puteoli, named Portus Iulius, where an old Greek dam was restored to create an artificial lake, Lacus Lucrinus, which was then connected by a channel to another lake, Lacus Avernus, which was traditionally one of the entrances to the underworld. Later, this harbour was seen as less ideal, because of silting problems, and a new complex was built further west, at Misenum, where two lakes were connected to become the basis of the western Mediterranean war fleet. This major naval base needed large quantities of fresh water for the base itself and for the ships, which must have been one of the reasons why Augustus had a new aqueduct built. This aqueduct, probably in antiquity known as the Aqua Augusta, partly followed older Samnite constructions in the east. When it was finished, the main channel was 96 km long, and had 12 to 14 branches to towns along its trace such as Nola, Pompeii (? 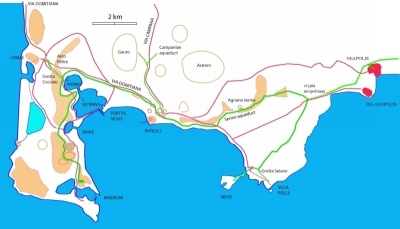 ), Atella, Acerra, Neapolis, Puteoli, Cumae and Baiae. There was possibly also a branch to Herculaneum. With these branches, the complex may have had a length of over 150 km (including branches). The Aqua Augusta is not well known because there are no remains of spectacular bridges, but it is a significant piece of engineering. The source, the Fons Augusteus, is now known as Acquaro-Pelosi and lies near St Lucia di Serino at an altitude of 376 m asl. Nearby, a lower spring at 320 m serves as a source of another aqueduct that brought water to Beneventum. The landscape in which the aqueduct is situated is not the same as it used to be in the time of Augustus and the imperial age. First of all, several eruptions of the Vesuvius, starting with the one in 79 CE covered the branch to Pompeii to inaccessible depth, which also counts for parts of the aqueduct in the north. 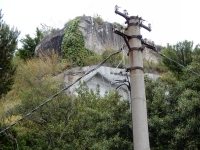 In the Campi Flegrei west of Naples, the situation is even worse: this area is underlain by a massive magma chamber which lifts and drops the landscape by several metres over the years, a phenomenon known locally as "bradisismo". 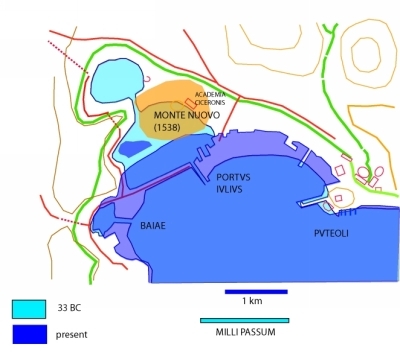 As a result, the roman town and harbour of Portus Julius is now under water just of the coast west of Pozzuoli, and part of ancient Baiae is also covered (see map 3). In 1538, a new volcano, the Monte Nuovo, suddenly has been formed west of Pozzuoli in the course of a few days, with an altitude of 120 m. This volcano destroyed a number of roman ruins, and part of the site of lake Lucrinus. Erosion and excavation of the local tuff for construction has also ruined some archaeological sites. However, a large part of the aqueduct in this area probably still exists below the surface. From the source, the aqueduct ran mostly underground with some major tunnels, like the one below Mount Paterno with a length of 1903m. The aqueduct passed north of Vesuvius to Naples, north of the city and then through Pozzuoli and Baiae to the end at the naval base of Misenum. Here, it certainly served one of the largest reservoirs in the Roman world, the Piscina Mirabilis but it may have extended further towards other parts of Misenum. 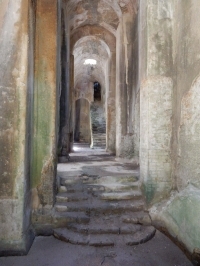 There were sections of arches such as a stretch 3.600 m long and 4-5 m high at Pomigliano d'Arco NW of Vesuvius and near Naples. But most of the aqueduct was buried, which probably explains why it attracted relatively little attention. Some parts of the aqueduct were built as two parallel channels, one buried, and one on arches (between Mura d'Arco and Vallone del Monaco); it is unknown if these were active at the same time or built one after the other for repair purposes. The total relief of the aqueduct is 366 m from the source to the Piscina Mirabilis at 10 m altitude, which gives a mean gradient of 0,33%. The gradient varied considerably, though. From the source to Cadutta della Laura 7,3 m/km; from there to Monte Paterno 0,52 m/km; to Pomigliano 0,39 m/km; from there to Naples (Ponti Rossi at 41,4 m) 0,16 m/km; and finally to the Piscina Mirabilis 3 m/km. The gradient therefore varied from 0,016% to 0,73%. The specus of the aqueduct varied in size, but was mostly 0,8 m wide and 1,5 m high. 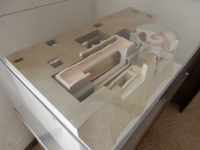 The maximum capacity at the upper sections is calculated at 550l/s, which would be a total of 48.000 m3 per day (min 35.000 - max 121.000 m3/day; Keenan-Jones 2010). 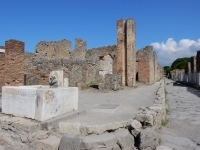 Pompeii was one of the towns probably served by the aqueduct, and the capacity of the branch that ended here in the castellum aquae was 46 l/sec. If each of the 12-14 main consumers on separate branches had a similar capacity, the total estimate of 550 l/sec is reasonable. From the source at St Lucia di Serino the aqueduct runs to Mercato di Sorino where it crossed the Sabato river on a bridge to the west to Aiello. It passed below Contrada in a major (6 km long) tunnel, then through the plain of Forino through Preturo, Pandola, Tor di Marcello, Castel S Giorgio and Tavera di Lazzaro to a tunnel below Monte Paterno of 1903m long towards Sarno. 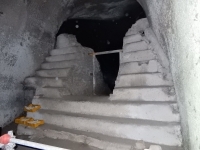 Through Episcopo and Palma it continues to Mura d'Arco where it ran in a double section, one buried and one on arches to Vallone del Monaco where both branches join again. 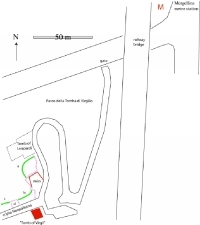 The following section passes through Torricella, San Gennaro Vesoviano, Piazzolla, Martino, S Maria del Pozzo, La Masseria San Rossio, Masseria la Preziosa and then over a section on arches - 3598 m long - to Pomigliano. Then through Casalnuovo, Afragola, San Pietro a Patierno to San Giuliano north of Naples where there are remains of an aqueduct bridge (Ponti Rossi - 125 m long). 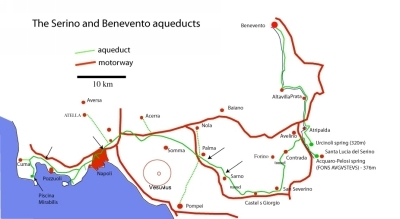 Map 2: From Naples to Misenum (aqueduct in green). 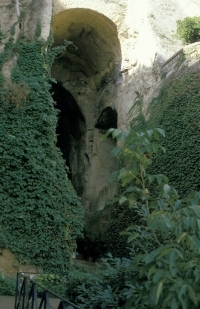 The aqueduct circled Naples below the hills of San Eframo, Santa Maria del Virgine, to Santangelo, where a branch went south to serve the city of Neapolis through Porta di Costantinopoli and San Patrizia. The main channel followed the route through S Elmo and Chiaia to a tunnel to west of Naples (Map 2). 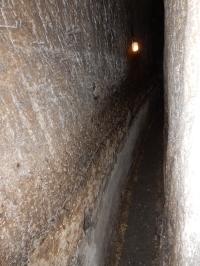 This is a major road tunnel, the Crypta Neapolitana, 5m high, 4,5 m wide and 710m long, wide enough to have to carts pass each other. It was built by L. Cocceius Auctus, a freedmen architect who came from this area and probably worked for Agrippa. The aqueduct does not lie in the tunnel itself, but runs parallel to it at a high of 0,50 m from the base of the tunnel on its north side. 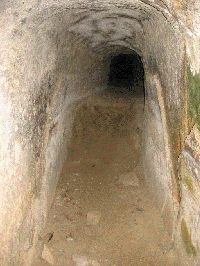 On the west side of the tunnel, the aqueduct then branched; one branch went south to a junction at the coast, where a branch probably went over a bridge to the island of Nitida , while another passed parallel to but on the north side of another road tunnel, the Grotta Seiano, to serve the large imperial villa at Posilippo, (Pausilippon) also known as the Villa Polii after its first owner. 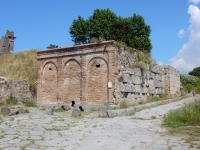 The main branch of the Aqua Augusta left the Crypta Neapolitana to the west with a small side branch to the large bath complex of Termi di Agnano. From there, it passed through Pozzuoli with a branch to the city, then along the via Domitiano to circle the Lake of Averno (970 m long). Here a side branch passed parallel to and at the north side of another road tunnel built by Cocceius to Cuma (for those interested: there are at least seven roman road tunnels in this area !! - see map 2). The main channel then follows the flank of three craters above Baiae and on to Misenum. Until 1938 the construction of the Aqua Augusta was credited to Claudius. Based on the inscription above from the 4th c CE it is thought that Augustus was the builder; perhaps Claudius was responsible for the extension to Misenum. The Aqua Augusta filled several reservoirs in the section beyond Naples. 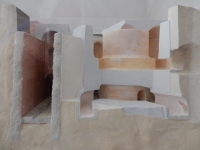 This can be established because the local water contains little calcium carbonate in solution, while that of the aqueduct comes from a karst-source, and is rich in calcium carbonate; as a result, it deposits sinter in the main channel, and in any reservoirs it helped to fill. 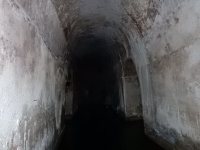 In Pozzuoli, the aqueduct served several reservoirs, notably the Piscina Lusciano (35x20m) from the first century CE, and in Baiae, two reservoirs adjacent to a tunnel known as the Crypta Romana. The main reservoir filled by the aqueduct is the Piscina Mirabilis in Bacoli (Misenum), which could contain 10.700 m3. Close by are two other large reservoirs, probably belonging to large villas, the Grotta Dragonaria and Cento Camerelle, but both were not filled by the Aqua Augusta aqueduct, which also counts for the Piscina Cardito (55x16m) from the second century in Pozzuoli. 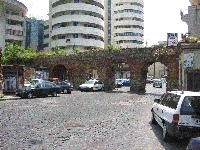 In the Via Niccolini in Naples (Italy) alongside a series of modern white circular buildings are the remains of two aqueduct bridges of the Aqua Augusta. These "ponti rossi" (red bridges) cross the Miano valley with a length of 125 m and with an average height of 5m, supporting a specus of approximately 1.5 m high and 0.79 m wide. This whole area of Naples is named after the bridges Ponti Rossi. The southern bridge is best preserved, with some of the eastern arches blocked up in gardens, but traffic still passing underneath the central arches. The southern bridge changes into a supporting wall to the west. 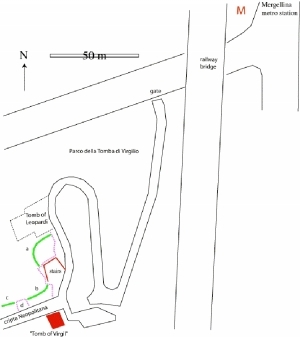 The bridge can best be reached as indicated on the map, from an exit on the motorway that crosses Naples by a roundabout way; a more direct road is difficult because the motorway crosses the Miano valley on a high bridge, and because of one way streets. For those not used to Naples traffic - take care! Parking is easy near the white circular modern buildings. 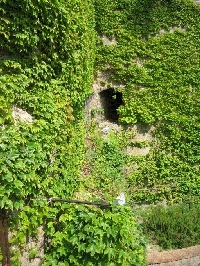 A section of the Aqua Augusta can be seen in a small park, the "Parco di Tomba di Virgilio", close to the Mergellina Metro station. 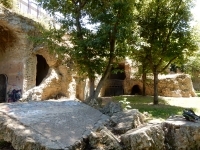 The park is named after a roman grave monument known as the "Tomba di Virgilio" (Tomb of Virgil), and although Virgil was buried somewhere in the area, there is no indication for any connection of the tomb with the poet. The park was created in 1930 to commemorate the 2000th birthday of Virgil. 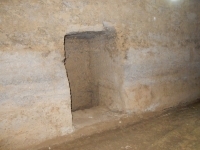 The tomb stands at the western end of the 710m long roman road tunnel of the "Cripta Neapolitana" about 10 m above the road. This elevation, and the impressive height of the roman tunnel are due to the fact that the area was used as a quarry in later time, and that the road level in and outside the tunnel was considerably lowered. 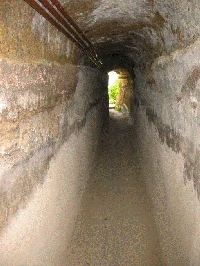 The aqueduct channel is excavated in the local soft volcanic pyroclastic rocks. 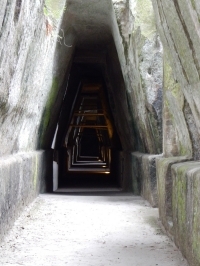 It ran in a separate tunnel parallel to the roman road tunnel and is now also suspended high up in the park, and partly destroyed by later quarrying. The remains can be seen by ascending the steep stairs at the top of the road that crosses the park: section A is not accessible and is cut off at two sides by quarrying. Section B can be entered to reach a small platform with medieval frescos and a view into the Cripta Napolitana. 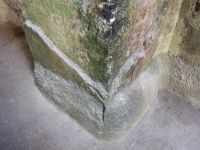 A 1 m high layer of opus signinum is preserved in the specus and along the wall of this platform. 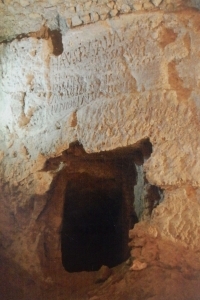 The opus signinum is directly applied to the walls of the tunnel here. 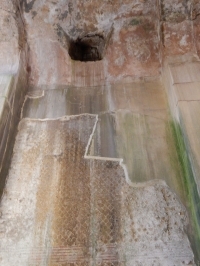 The vault of the aqueduct is carved out in the rock. Section C enters the mountain but is half filled with sand; it crosses the mountain to the west side. The park is officially only open in the morning from 9-12 h and not on Sundays. 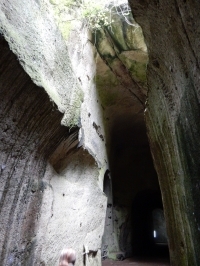 A cross section of the Aqua Augusta can be seen opposite the entrance of the archaeological park of Baia, about 3 metres above the road on the north side; it is hard to distinguish from the surrounding yellow volcanic pyroclastic rocks, but consists of a masonry channel, built into an excavated gully in the rock. Naples The Bolla aqueduct carries water from a marshy depression near Vesuvius to Naples. It is fed by an aquifer of pyroclastic and sedimentary deposits. 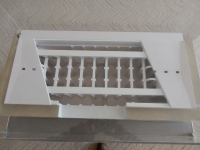 Numerous different channels were added at different times to drain the area, converging at the 'casa dell'acqua' to supply the Bolla. 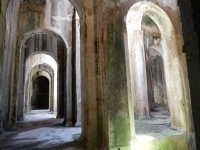 From the 'casa dell'acqua' at an elevation of approximate 18,5 m asl, the aqueduct travels 8 km or less directly to the Porta Capuana at Naples, where it enters the city underground at a height a circa 13 m asl. This gives the Bolla the very gentle mean gradient of 0,069 %. Naples is the only town known to have been supplied. Once inside the city wall, the Bolla spread out in a complex network of underground channels, which supply properties in the city via wells. 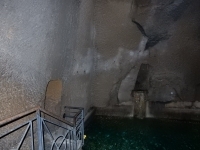 The height of the northern part of the city would have required wells of more than 20 m deep to access the water of the Bolla, and wells of this depth were rare at this time. The construction varies greatly along the route. Part of the distribution system within the city is built of opus reticulatum. The hypothesized dates for the initial construction of the Bolla range from the 5th c BCE to the Middle Ages. The Bolla and its distribution system, augmented by the Carmignano aqueduct in the 17th c, was the main water supply of Naples from at least the Middle Ages until the late 19th c when it was replaced by the new Serino aqueduct. It still supplies water for industrial purposes to outlying areas of Naples. Pozzuoli Pozzuoli was also served by a small aqueduct coming from the north, locally known as the Campanian aqueduct. It probably predates the Aqua Augusta, and has a specus of 0,7 m wide and 2 m high. It ran from sources outside the city to the Piazza Principale in the low town of Pozzuoli. Ruins of this aqueduct can be seen near the amphitheater, and to the north of the city. 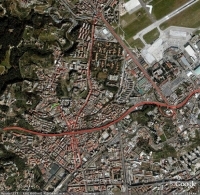 Benevento Benevento was served by a 36 km long aqueduct that is sometimes associated with the Aqua Augusta channel. 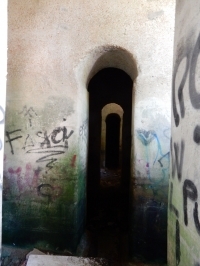 Although the aqueduct has it source near Serino as well, it starts at a lower level from a source at 324 m, too low to have been used for the Aqua Augusta. The Benevento aqueduct ends in reservoirs near the Arco di Tito at an altitude of 150 m, and had a specus (near the source) of 0,70 m wide and 1,70 m high. It was mostly covered with bipedales set against each other in gable-shape. The aqueduct crossed the Sabato river twice on bridges of a single arch. The aqueduct has a mean gradient of 5 m/km, or 0.5%. The gradient varies along its length: from the source to Prato 0,1%; from Prato to Altavilla Irpina 0,7%; from Altavilla to Ceppaloni 1,3% and from Ceppaloni to Benevento 0,2%. Interestingly, the amount of sinter deposited on the specus wall seems to be thicker where the slope of the aqueduct is steeper. 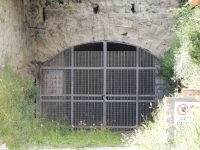 -	In Via Tribunali, near St Paolo Maggiore; entrance to the aqueduct section and reservoirs below the city. This is the side-branch that served Neapolis. A guided tour can be made. 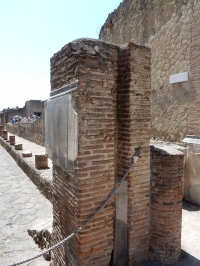 The Pompeii branch can be seen at the back of the castellum divisorium in Pompeii, see separate entry on this website. How to visit : see above.